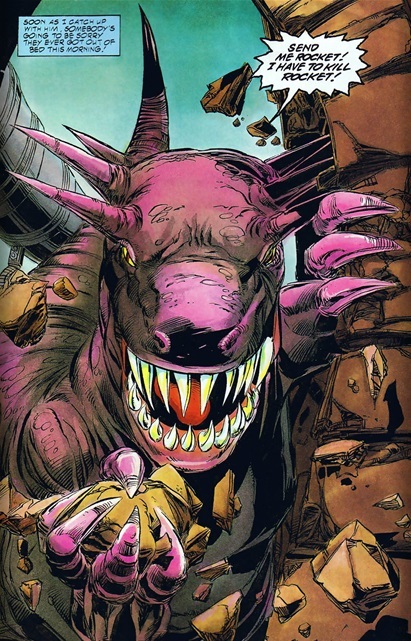 Powers: Bubba has the ability to transform into a large purple skinned dinosaur with razor sharp teeth and claws, enhanced durability and sight. Further mutation later granted him the ability to breath fire. Bubba was a member of the Paris Bloods alongside Wise Son and Holocaust. During the Big Bang he was one of only a handful of people to survive. He was granted the superhuman ability to transform into a large purple reptile that looked remarkably like a dinosaur (Blood Syndicate #11). After witnessing all that death he decided to leave the gang life behind him and instead try to finish high school and turn his life around. Back in high school his temper landed him in trouble constantly. This resulted in him landing in both the counselors office and the principals multiple times. The straw that broke his camels back was when the principal in a fit of frustration told Bubba to “save the taxpayers some money by killing himself” (Blood Syndicate #11). This principal Carlos Quinones, Sr. also expelled him from school. Desperate to get back into school he confronted the counselor first but when she refused to help he ate her (Blood Syndicate #12). Bubba then confronted the principal who manged to elude him long enough to contact the fire department and his son Fade arriving on the scene. Fade seemingly fatally wounded Bubba before a mysterious team of paramedics took his body away (Blood Syndicate #12). Taken by S.Y.S.T.E.M where they healed his wounds and experimented on him. It was their hope to turn him and other Bang babies into living weapons. They were then exposed to Quantum Juice once more in hopes of inducing further mutation. After the experiment himself alongside Masquerade and his fellow Bang Babies escaped to the surface and all separated (Blood Syndicate #19-25). He came to the attention of former gang member Holocaust who recruited him as an enforcer. To mark his entry into this new life Holocaust had him challenge Icon’s partner Rocket. Unfortunately for him she proved quite formidable and defeated him (Icon #38-39). He then joined a new incarnation of the Blood Syndicate alongside Fade, Flashback, Rocket and others (Icon #39). Hi. I think you might have to fix the creator credit. Bubbasaurus was created by me, Ivan Velez and Chris Cross.